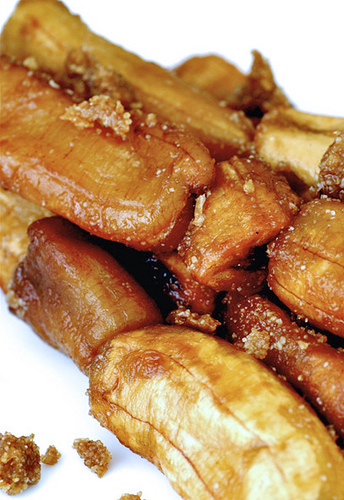 Consisting of only bananas, brown sugar and oil, the banana-que definitely falls within the 5-and-below-ingredients-wonders. Obsessed, I chatted with a couple home cooks and vendors over the past weeks and what I found interesting was that they all told me the same thing, to make a good banana-que one slow-fries semi-ripe plantain bananas over medium heat for a few good minutes. This step is crucial for the bananas to develop a slightly harder but still pliable exterior, keeping the oil out and allowing the insides to steam-cook. (I can’t tell you how many times I’ve bitten into a seemingly perfect banana-que only to find the insides unpleasantly hard and crumbly. Results of rushing the slow-fry process? Or maybe using unripe plantains?). 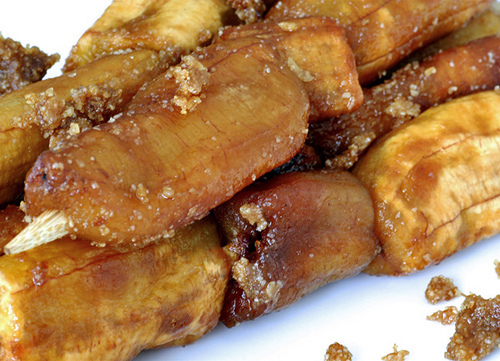 Brown sugar or panutsa (raw sugar) is then mixed towards the end to coat the bananas, stirring everything constantly to prevent or minimize burning. Skewer, drain and cool on banana leaf or rack. Done. This afternoon I drop by my favorite nondescript banana-que stand to take home a few sticks for “photographing” (i.e. eating). I get the bananas seconds after it was taken out of the hot oil and when I got home, it was just the perfect temperature for tucking into. If I had eaten it right after frying, I would’ve singed my mouth with both the molten sugar and the steaming insides. Not to mention the fact that the candy coating needed time to cool down and crisp up. So warm was the way to go. I shoot fast. After a few agonizing minutes I was finally rewarded with a bite and was not disappointed. 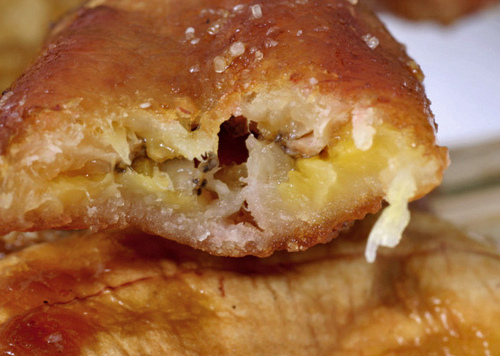 Thank God for people who fry bananas to perfection for a living. As for my gauge for a good ‘que: there should be 3 identifiable textures. First, the crunchy caramelized sugar coating, second, the pleasantly toothy banana exterior and finally the tender, almost gooey, amber colored flesh, all in one bite. The thicker the sugar coating, the better, I say. And while “interesting” versions of the banana-que has appeared of late gussied up with sesame seeds, scoops of ice cream, crème anglaise and, heaven forbid, even transformed into a pastry, my favorite version will always be the one on a bamboo skewer. Those bananaque look so yummy!!! What some right now. I appreciate the uniqueness of these photos, definitely not the prosaic on-a-stick standby. I love how you can make banana que sound soo yummy! one of my faves!!! of course, i love camote-q also.